Gaelynn Lea is the winner of the 2016 Tiny Desk Contest. By now, you might have heard that NPR Music has chosen a winner for the 2016 Tiny Desk Contest. The haunting violin strains and melody of Gaelynn Lea's song "Someday We'll Linger In The Sun" stood out as our judges viewed the roughly 6,100 video submissions. Lea is used to performing music in her hometown of Duluth, Minn., but next week, she'll play at Bob Boilen's desk here at NPR. She recently joined NPR's Audie Cornish to discuss her unique style of playing and the inspiration behind the song she submitted to the contest. Hear the radio version at the audio link and read an extended version of their conversation below. Audie Cornish: So, Gaelynn Lea, first of all: Congratulations. Gaelynn Lea: Thank you so much! Tell us a little bit about this song and how it came about. Well, this particular song came to me when I was in the shower. That's great! I love that. So I'm not the only one. No, a lot of things come to me in the shower! I had the first line, and it kind of festered in my brain for about a month, and then finally I wrote it. And I wrote it about love, but not a love that's necessarily easy. I believe that love is a struggle, but a positive one. And so that's what I tried to convey in the song. Listening to your other music, there's a lot of layering and looping, which has become very popular. But I understand when you first started using looping techniques, you weren't a huge fan. Yeah, that's true. When I got a looping pedal from my friend Alan Sparhawk [of the band Low], he said, "You know, I think you should figure out how to use this, and you can play your own shows someday." And I thought that was ridiculous, because I've always been in bands. I've never thought of myself as a solo artist until the last two years. And so I started working with the pedal, but the timing has to be really precise. If you don't time it out right, the whole song is ruined. And so it just took a couple of years to really get comfortable with it — where I know what is going to happen when I press the button every time. So you're the winner of this Tiny Desk Contest. And the video you submitted is very interesting, because when it opens we don't actually see you at first — the camera is not trained directly on you. What's going on, and what were some of the decisions there? Well, my friend Leah [Nelson] and I shot the video together in my office — before we went downstairs for half-priced wine in the building I work at. And I told her, "I really want to enter this contest. A bunch of people have told me about it, but I don't have a videographer. Will you just come up and help me tape it?" And she actually thought of doing that angle, but the second she said it, I was like "Wow, that's perfect." Because when you have a disability, especially one like mine where it's pretty visible — I didn't want that to necessarily be the first impression. Not because I'm ashamed of it, in any way, but just because I wanted it to be about the music. And we should explain to people this is a congenital disease, commonly known as "brittle bones disease," correct? Yep, it is. And so my arms and legs are bent, and they're pretty short. And I play my violin like a cello — I don't even play it the way that most people do, up on their shoulder. So it's pretty different-looking. And so I just didn't want that to be the first thing that people thought about. Because I know it's a music contest, and I really wanted to be competitive that way. That was the one thing I had control over. Could you tell me about the title of the song? "Someday We'll Linger In The Sun" is about, to me, how love might be a struggle now, but that it's worth hanging on, because someday we'll be able to be together and happy and calm. Maybe not in this lifetime, but I believe that someday, people who really love each other will get to experience it on a bigger level. Now, I understand that you also play in public a lot in northern Minnesota, right? Farmers markets, pizza restaurants, the boardwalk near Lake Superior — and now you're going to play at Bob Boilen's desk. What is it that you like about performing your music before people like this, in all kinds of venues? Well, I have always loved performing in one way or another. Before I could even read, I was in my first play. They had to record my lines on a cassette tape and I learned them by hearing them. And so performing is something that's in my blood; it's actually something that both of my parents do. They're into theater. [Performing] just gives you an energy and a connection with other people that I just haven't ever found anywhere else. It's like a direct connection with, I don't know, my spiritual self. So I love performing, but the thing that I try to remember — because I believe it's true — is that any kind of performance is really valuable, because every person is valuable. So I like playing at that pizza shop — I play there every other week. I've done that for like a year and a half. And I like playing on the boardwalk, because you get to play for little kids, and they always want you to play, like, "Itsy-Bitsy Spider," but they're excited about it and that's what matters. I just think music in general is something that can really connect people, and it's just an honor and joy to be able to tap into that. You know, thinking about how you play your instrument actually makes me curious about how you came to play this instrument. What's the story behind how you started playing? When I was in fifth grade, we had the offer to skip class to take a music listening test, but I was actually the only person in the fifth grade that got a perfect score. And the orchestra teacher took note and took it upon herself to help me figure out how to play, because she knew that I could probably do a good job if we figured it out. So she was really awesome and encouraged me to experiment. We tried a cello at first, and it was too big. We tried a regular violin, and even a smaller-sized violin, but all of those were too big to be on my shoulder. So that's kind of how we combined the two ideas. Do you want to say her name? I can't help but want to shout out a music teacher, given the opportunity. Her name was Susan Sommerfeld. I've had a lot of great music teachers, but without her, this obviously would never have happened. That's one thing I try to tell people in the speeches that I do — because I do some public speaking — is that if you have if a friend or loved one [who] has an idea that they really want to do, just don't discourage them. Because I'm a very unlikely candidate, in many ways, to be doing music as a career. ... But she wasn't thinking of it like that, and she just said, "Well, this is what she wants, and we're going to figure it out." So that's so big. Because she easily could have said, "You know, maybe you should do choir, instead, because this is going to be too hard," or "I don't see how this is going to work." So I was so lucky. I mean, really lucky for that. You were announced as the contest winner this morning on Morning Edition. What's the day been like? It's just been really humbling and exciting to get all the positive feedback from my family and friends and people I haven't met, and emails from reporters — it's really weird, but it's cool! I've always loved playing, and I was happy with where I am in my career in Duluth — nothing was wrong — and this is just the icing on the cake. I mean, really thick icing on the cake. Well, you're not only performing here at NPR, at the Tiny Desk, but you'll be heading out on a four-city tour with NPR Music, which sounds super-exciting — a whole new level of audience. Yeah, and you know, what is so fun about this is, I have been talking a lot about trying to set up a tour on my own. Because as an artist with a disability, one thing I want to do is travel. I want to make sure people see it, and know that it's possible for a musician [with a disability] to have a full-fledged music career. These haunting violin strings grabbed our colleagues at NPR Music. It's a melody that stood out as they viewed 6,100 video submissions for this year's Tiny Desk Contest. Unsigned musicians from all 50 states sent in videos in which they perform one song. The contest was inspired by our Tiny Desk Concerts. Musicians of all genres play at the cubicle desk of NPR's Bob Boilen. And soon, the winner, this musician, will play at the desk. GAELYNN LEA: (Singing) You held my hand until the end, and I love you. CORNISH: That's Gaelynn Lea of Duluth, Minn., and we're hearing the sound of her submission. 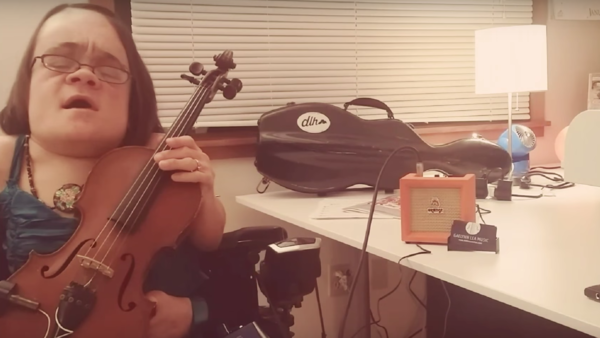 Gaelynn is singing and playing her violin solo but with a pedal that can loop and layer her instrument. CORNISH: And she joins us from member station KUWS. Gaelynn Lea, congratulations. LEA: Thank you so much. CORNISH: Now, tell us a little bit about this song - it's title, how it came about. LEA: "Someday We'll Linger In The Sun" - this particular song came to me when I was in the shower. LEA: A lot of things come to me in the shower. And I wrote it about love but not, like, a love that's necessarily easy. I believe that love is a struggle but a positive one, and so that's what I try to convey in this song. CORNISH: The video submitted is very interesting because when it opens, we don't actually see you at first, right? Like, the camera is not trained directly on you. What's going on, and what were some of the decisions there? LEA: Well, my friend Leah and I shot the video together in my office before we went downstairs for half-price wine in the building I work at. LEA: And I told her, I really want to enter this contest. A bunch of people have told me about it, but I don't have a videographer. Will you just come up and help me tape it? And she actually thought of doing that angle, but the second she said it, I was like, wow, that's perfect because when you have a disability, especially one like mine where it's pretty visible, I didn't want that to necessarily be the first impression not 'cause I'm ashamed of it in any way but just because I wanted it to be about the music. CORNISH: ...Commonly known as brittle bones disease, correct? LEA: Yep, it is. And so my arms and legs are bent, and they're pretty short. And I play my violin like a cello. I don't even play it the way that most people do up on their shoulder. And so it's pretty different looking, and so I just didn't want that to be the first thing that people thought about because I know it's a music contest, and I really wanted to be competitive that way. That's, like, the one thing I had control over. CORNISH: Thinking about how you play your instrument actually makes me curious about how you came to play this instrument. What's the story behind how you started playing? LEA: When I was in fifth grade, we had the offer to skip class to take a music listening test. LEA: But I was actually the only person that got a perfect score. The orchestra teacher took it upon herself to help me figure out how to play. We tried a cello at first, and it was too big. We tried a regular violin and even a smaller-sized violin, but all those were too big to be on my shoulder. So that's kind of how we, like, combined the two ideas. CORNISH: Do you want to say her name? I can't help but want to shout out a music teacher. LEA: Her name was Susan Sommerfeld. And I've had a lot of great music teachers, but without her, this, obviously, would never have happened. CORNISH: Well, you were announced as the contest winner this morning on MORNING EDITION. What's the day been like? LEA: It's just been really humbling and exciting to get all the positive feedback from my family and friends and people I haven't met and emails from reporters. It's really weird. LEA: But it's cool. I've always loved playing, and I was happy with where I am in my career in Duluth. And, like, nothing was wrong, and this is just, like, the icing on the cake - I mean really thick icing on the cake. CORNISH: (Laughter) Gaelynn Lea is this year's Tiny Desk Contest winner. Congratulations. CORNISH: Later this month, Gaelynn Lea will perform a Tiny Desk concert at NPR headquarters and will then head out on a four-city tour with NPR Music. (SOUNDBITE OF GAELYNN LEA SONG, "SOMEDAY WE'LL LINGER IN THE SUN") Transcript provided by NPR, Copyright NPR.